Make a two layer cake the size that you need. Ice the cake between the layers using white icing. Next, ice the entire cake making sure the surface is as smooth as you can make it. With white icing and star tip, size #32, make a shell border around the top edge and the bottom edge of the sides of the cake. Dip mini Oreo cookies in melted chocolate. I usually put them in the freezer for a few minutes. This way you can handle them right away. Put the chocolate covered cookies spaced out around the bottom of the cake. To make the barbells, dip a piece of uncooked spaghetti in the chocolate. Let it set in the freezer. Dip the ends of the spaghetti in the melted chocolate and attach to the bottom side of the chocolate covered cookie. Repeat for the other end. Make two barbells and place them on top of the cake. 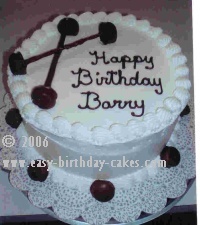 Use a chocolate icing and round tip, size #5 and write the birthday message on top of the cake.